If you want to use social media to market effectively but are confused by all of the conflicting information in the marketplace about how to do it best, it can help to take a step back to see the bigger picture before jumping into the fray and just hoping for success. 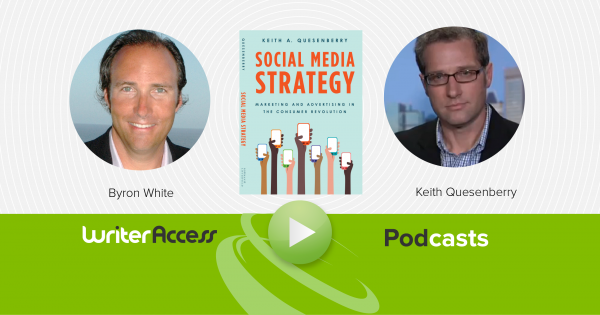 Author Keith Quesenberry recently sat down with WriterAccess CEO Byron White to talk about what he learned when researching and writing his book, Social Media Strategy: Marketing and Advertising in the Consumer Revolution. In that conversation, Keith, who also teaches digital marketing and social media marketing classes, shared some examples of effective social media marketing strategies and shared tips that anyone can implement to increase the effectiveness of an existing or new social media strategy. Find out why treating social media marketing the same way we treat traditional media marketing doesn’t usually work well. Learn why jumping in and opening a new social media account to begin sharing posts should not be the first step you take! Limiting social media interaction to the marketing function can be a big mistake for any company; learn how teams can effectively leverage social media channels to handle customer service, human resources, research and development and more, in addition to marketing and communications. Focusing on what to share on social media is only one part of the equation; learn why successful social media marketers also focus on the who, when, where and why. Every day, we have access to hundreds, if not thousands, of new social media tips, but many organizations still struggle with how to create an overall strategy that actually works. To learn more about Keith’s research and recommendations, you can find the full 25 minute podcast here. Listen to the Writer Podcasts wherever you go!